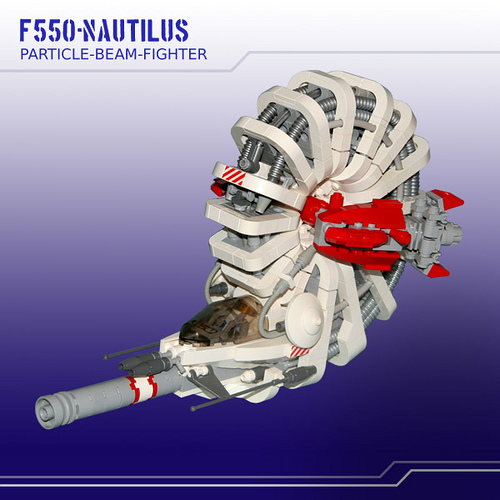 The F550-Nautilus Fighter by Ben Jarvis is crazy beyond my imagination. It consists of an intricate skeletal shell laced with tubings. I still can’t put my mind to it. Wow! Don’t try this at home, kids. Stupendous! Not just as a LEGO build, but also as a starship fighter design. I want to see this design in a movie, it’s incredible and very well-realized. And as LEGO, of course, it’s also incredible and you’ve fitted it all together wonderfully. Love it! Yes! A brilliant design that removes some of the “fiction” in “science fiction” — it makes my little scientist heart warm and fuzzy. Far out, that is some mad skillage right there. Well, particle acceleration is a bit more realistic than lasers that go “pew pew”. ^ I see your point but… why would you fly one around in space where there’s nothing (statistically) to shoot. And why wouldn’t you just use a high-powered laser, or even more effective in space, a good ol’ fashioned projectile. Your second version of the statement suits me much more.